Jules Lavirotte was a wildly talented architect whose whimsical and flamboyant Art Nouveau style made him famous. He won Concours de Façades de la Ville de Paris awards for two of his buildings in the 7th arrondissement of Paris. He won once for 29 Avenue Rapp and again for 34 Avenue de Wagram, now known as the Ceramic Hotel. 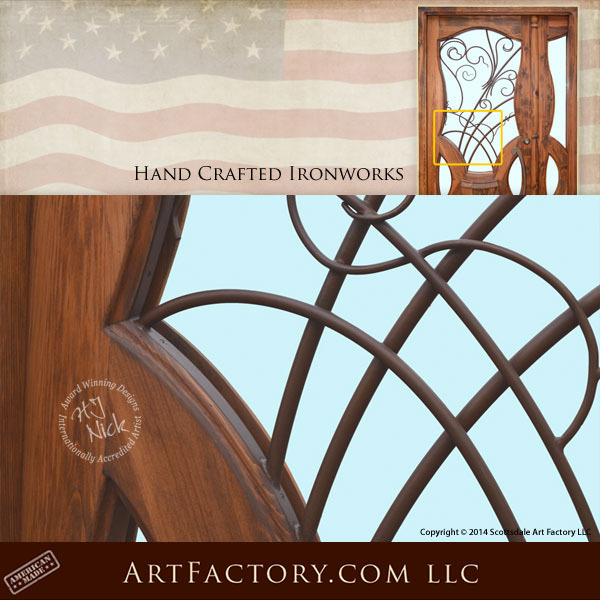 His designs are full of flowing and original ironwork, including his doors. Award winning artist H.J. Nick has taken Jules Lavirotte's styling from his double door at 3 Square Rapp and designed this single, custom Art Nouveau door with a sidelight and hand forged flowing ironwork. Just because you have a narrow entrance doesn't mean you can't get fine, quality artwork as your door. 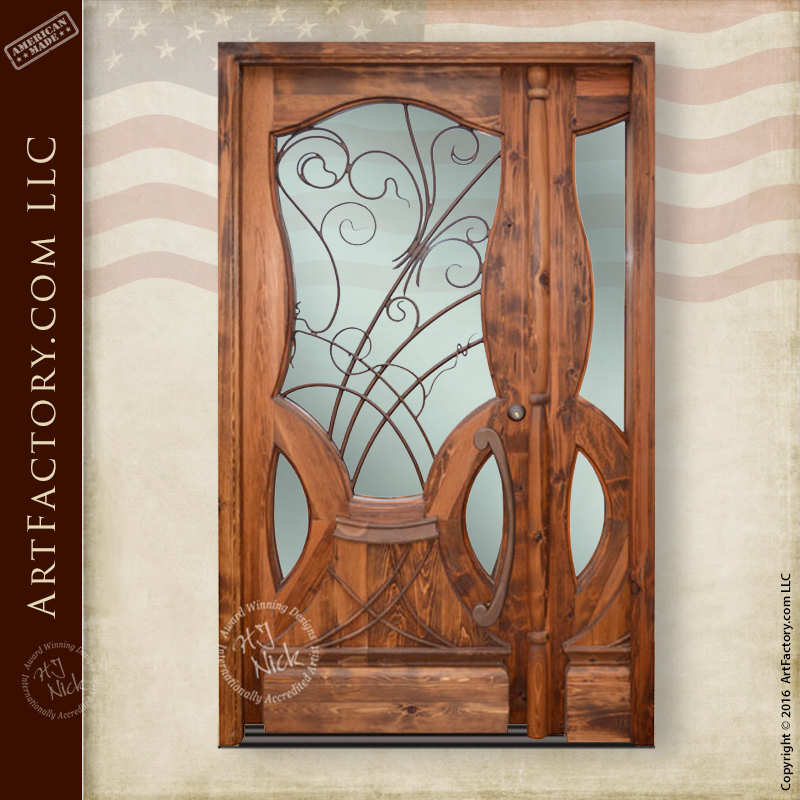 As this door shows, ArtFactory.com can replicate the style of any artist that you like, and turn it into something that fits your needs. We also build all of our historically inspired doors using period correct methods and materials. To top it all off, H.J. Nick signs all of our products as certified works of fine art, the ensuring that they have future appreciable investment value. 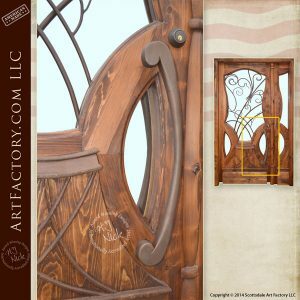 This custom Art Nouveau door design, created by master craftsmen at ArtFactory.com, is created in original hand and craft. The difference between low quality reproductions, and historically inspired fine art is in the details. This means using the correct methods and materials that were used to create the original. That is why we build all of our doors from solid, full length, naturally air dried timber. The custom Art Nouveau door also features a beveled glass window and side light. The hand carved door panels continue the custom window grill artwork design. This creates one continuous flow of artfully crafted design. Our master blacksmiths, hand hammer the wrought iron scroll work on the secure window grill to fine art quality. Furthermore, the custom French Art Nouveau style door handles, are made from solid wrought iron over a coal fired forge. All of our door hardware is hand patinated using our proprietary heat infused, iron oxide patina process. This process infuses the finish to the metal at over 1000 degrees Fahrenheit. This makes for a long lasting finish that will require little or no maintenance. The ironwork on the custom Art Nouveau door as shown has been finished with a bronze patina. This is just one of hundreds of color choices we offer. This custom door is available in any style, finish, or size. We can build you a custom door to match any historic design using the same craft and materials as the original. We can build any of our designs to fit your residential or commercial property. All of our doors come pre-hung, in a solid wood structural jamb that will easily bolt on to a standard metal store front. We can also build and of our door designs as custom gates, or custom garage doors. We work with builders, dealers, interior designers, and home owners to create custom doors that are uniquely designed to your exact specifications. You can further customize any of our door designs with hand carvings, custom hardware, or glass windows. The choices are endless when you order from ArtFactory.com. Our ability to design and built fine art quality entrances is limited only by your imagination. Not only that, but our combination of top grade materials, and master hand craftsmanship allow us to offer a quality of product that is unmatched anywhere, at any price. When nothing but the best will do, call to speak with one of our architects and get your custom quote today at 1-800-292-0008.